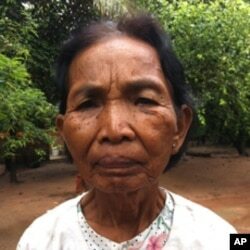 Im Chaem, a former Khmer Rouge commander who is among five suspects at the UN-backed tribunal, says she is innocent of charges levied against her by court prosecutors and jested in an exclusive interview that charges of war crimes would be “deadly” for her. According to an introductory submission by prosecutors obtained by VOA Khmer, Im Chaem has been implicated in a purge of the Khmer Rouge’s Northwest Zone and as head of a security center where an estimated 40,000 people died under the regime. The case against Im Chaem, Ta Tith and a third suspect, Ta An, known in court parlance as Case 004, is currently in the hands of investigating judges, who have said they have doubts about whether they were “most responsible” for atrocity crimes of the Khmer Rouge. Speaking at her home in Anlong Veng district, in Oddar Meanchey province, where she is a first deputy commune chief, 65-year-old Im Chaem told VOA Khmer she is not guilty of the crimes raised by prosecutors. Im Chaem, a former Khmer Rouge commander who is among five suspects at the UN-backed Khmer Rouge tribunal, says she is innocent of charges levied against her. A significant increase in arrests, killing and disappearances in the district followed, prosecutors wrote. Prosecutors say Im Chaem was the head of that security center.